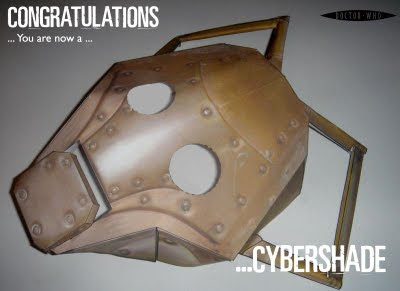 This papercraft Cybershade mask was a free download offered by the BBC to promote the Doctor Who television show during the 2008 Christmas season. Cybershades are variants of Doctor Who's long time enemies the Cybermen. The three page PDF template is available here. 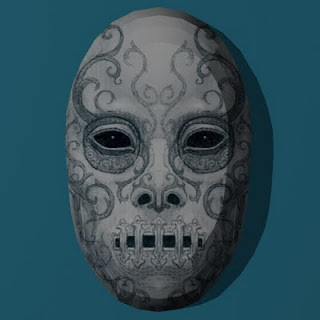 The only downside to building this mask is the lack of gluing flaps, but they can be easily improvised by most papercrafters with any experience. I don't usually do "work in progress" posts, but I will probably start doing more in the future. I have been working on several elaborate projects that will take longer to release and I wanted to give a taste of some of them in advance. This Lightcyclist Bust is about 30% of the way through the test build. 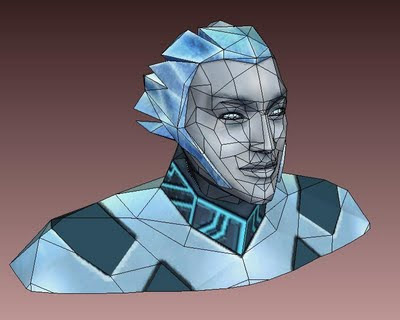 Once again the original model is from the Tron 2.0 video game. I decided to build a life size bust because the level of detail in the face made it difficult to do a smaller scale complete figure. As the project stands now, it looks like the template will have about 29 pages. Wish me luck! 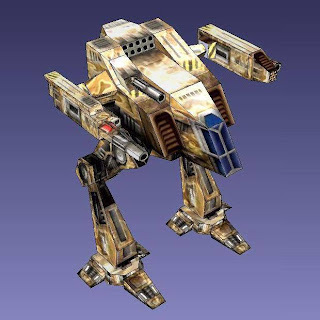 The Shadow Cat is one of the more popular medium class mechs available in the MechWarrior 3 video game. Weighing in at 45 tons, it is fast, has jump jets, and is capable of carrying a wide range of weapons. This papercraft version of the Shadow Cat is the creation of "MadCatManiac" and "Cantaris" at the Mech3.org forum. 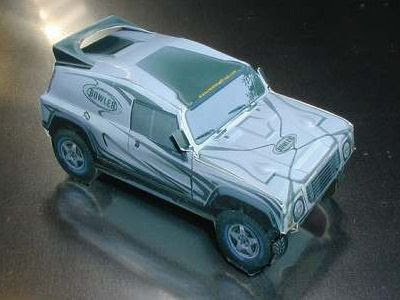 Pictured above is the desert camouflage color scheme which is my favorite out of the eight color schemes available. A download of the eight templates may be found here. 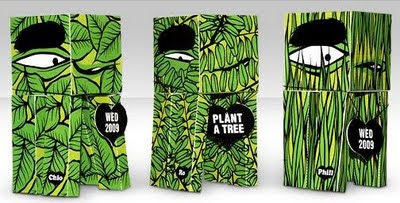 The templates are available in Pepakura PDO format only. I received an e-mail from MadCatManiac who filled me on the details of the creation of this model. The following Mech3 forum members were involved in the project: Eaterofpies (ripped the 3D model from the video game), MadCatManiac (created the template from the 3D model) and Cantaris (applied textures to the model). Here's a simple Star Trek Elite Force papercraft while I finish up more complex projects. 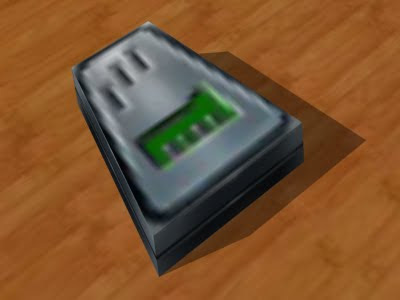 This is the mobile emitter worn by the Emergency Medical Hologram doctor on the starship Voyager. The mobile emitter is a self-contained holographic projector, generating the photons and force fields necessary to allow the holographic doctor to move outside the confines of the medical bay holographic emitters (even so far as to leave the ship entirely!). 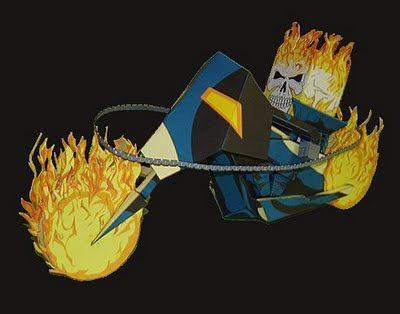 You don't see a whole lot of papercraft of Marvel Comics' Ghost Rider around. That's probably because it's tough to do all the flames. 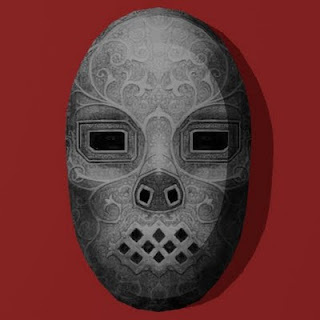 ^^ Joe Apodaca, however, has managed to do a pretty good job with this hako version of the Spirit of Vengeance. He gets a gold star for including a chain, too. ^^ The motorcycle and the figure are two separate models. Templates are available here. 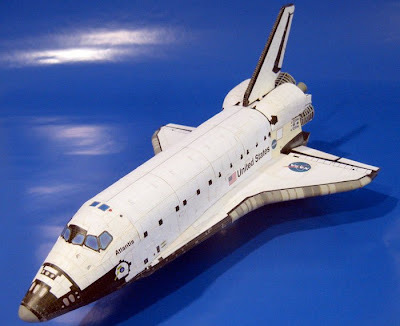 You would be hard pressed to find a more detailed papercraft space shuttle than this one. In addition to a "generic" space shuttle model, Italian designer Raimondo Fortezza has also created templates for each of the specific shuttles including Endeavour, Atlantis, Discovery, Challenger, and Columbia. The Atlantis model shown in the build photo above is the work of David Hanners who enlarged the original template slightly from 1:100 scale to 1:96 scale. Fortezza's shuttle templates are available for download at the Marscenter website here. Also available at the website are templates for detailed models of the International Space Station, Soyuz and other space exploration related models. 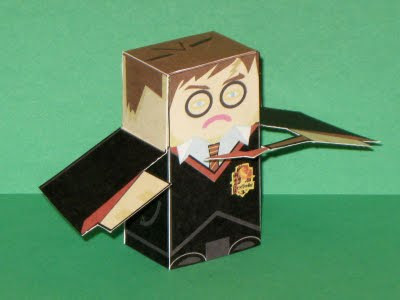 This Harry Potter paper toy doesn't look very happy. Then again, if I was an orphan and a dark wizard tried to kill me every year, I suppose I might not be very happy either. 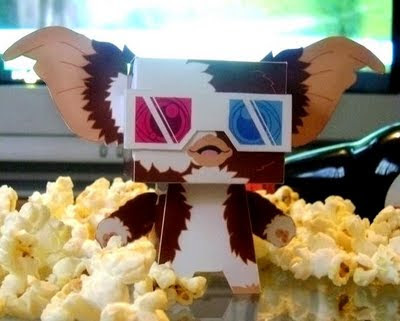 This papercraft Harry was created by Gavin Schmidtt at robotmartini.com using the blank "Briki" template. 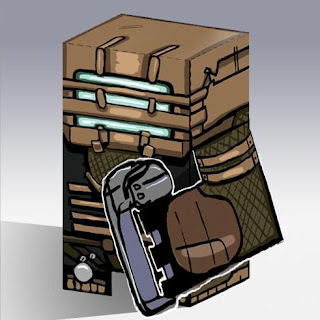 Briki paper figures were developed to be used in an open source multi-player tabletop combat game known as "Arena". 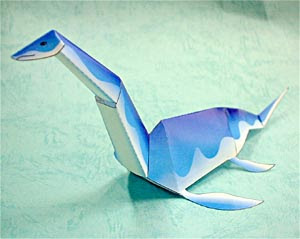 To get the above paper toy and Arena game rules, go here.